The 34-inch curved 21:9 ultra-wide Acer Predator X34 monitor is the world's first curved monitor with NVIDIA® G-SYNC™, providing an immersive gaming experience with minimal stutters and screen tears. DTS® sound, 2x7W speakers, a zero-frame design with a futuristic aluminum base and ambient lighting options create an exciting entertainment experience with style. The Acer Predator X34 features a curved 21:9 UltraWide QHD (3440 x 1440) resolution IPS display panel with a 178-degree viewing angle, providing an immersive experience in games and entertainment with a broader view. It supports 100% of the sRGB color gamut, delivering accurate color reproduction desired by design professionals and photo enthusiasts for precise color matching across applications and print output. "Acer continues to showcase its commitment to PC gaming with the introduction of their new NVIDIA G-SYNC-enabled Predator X34 gaming monitor," said Jeff Fisher, senior vice-president of the GeForce business unit at NVIDIA. "The preferred choice of PC gamers everywhere is a GeForce GTX GPU, which when paired with NVIDIA G-SYNC technology is the only platform to deliver an ultra-smooth gaming experience across the entire spectrum of PC games." For gamers, the Predator X34 supports multiple features that allow them to fine tune the monitor's performance, including 6-axis color adjustment enabled by NVIDIA G-SYNC, on-screen display of refresh rate, and three different aim-point icons to choose from. Users can easily identify when G-SYNC mode is on through a red ambient light at the lower edge of the monitor, of which intensity changes according to the instantaneous monitor refresh rate. Designed with ergonomics in mind, the Predator X34 can be tilted from -5° to 35° and adjusted vertically up to 130 mm, allowing the user to adjust the monitor to the most comfortable viewing angle. It also features flicker-less technology to lessen eye fatigue for a more comfortable gaming or working experience. 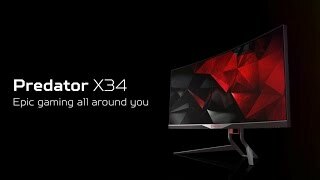 The Predator X34 supports DisplayPort and HDMI inputs, and has a built-in USB 3.0 hub which supports high-speed charging of smartphones and other devices. More links for "Predator X34 34" 3440x1440 IPS G-SYNC WideScreen Super-Wide ZeroFrame Curved LED Monitor"
There is a slight back light bleed, not noticeable when gaming. I can only reach 95hz and not the advertised 100hz, although on another review somebody mentioned this may be down to the quality of your hardware / high end cards but as I'm using a Titan X I doubt that is correct. The quality of this monitor is amazing, well worth the price, only downside is my monitor only overclocks to 90hz but as I run it at 60hz its not a big deal for me. Like many others, I was a bit nervous ordering this monitor, especially after reading the many horror stories on Internet forums and review sites. This is actually the second one I've ordered, the first was with another retailer which arrived with a dead blue sub-pixel near the bottom right corner. This was returned for a refund. The one I received from OCUK was pretty much flawless. It was from the Sep 2015 batch (ordered in Feb) which made me a bit concerned, but I can honestly say this was unfounded. There are zero pixel defects, neither dead nor stuck, and the backlight bleed is virtually non-existent. What is present is IPS glow. You're not going to get away from it, it happens to be a 'feature' of the technology and if it's something you're not happy about seeing, don't bother buying this monitor, you'll only be disappointed. The wider aspect ratio will exacerbate the glow in the four corners as these are viewed at more of an angle than a standard 16:9 monitor, especially if you sit in closer proximity than normal. There are other panel technologies such as TN or VA that don't have this issue, but they have compromises of their own. My monitor reaches the advertised 100Hz with no problems or frame skipping at all. If there is any coil whine when overclocked I certainly can't hear it, even on a pure white screen. Every game I tried ran up to 100Hz if it was supported, and G-Sync really is as good as everyone says. It's not a cure for bad frame rates, you'll still notice when it drops but it does make the whole experience feel more consistent with no stuttering or tearing. Please note that 100Hz is only attainable with certain higher end graphics cards, so if you can't get beyond 90 - 95Hz then it may be a limitation of your hardware and not a fault with the panel. I'm running a single GTX 980 Ti for reference. The last thing that everyone seems to complain about is the G-Sync scanline issue. This, in my opinion, is overblown to the point of nitpicking for nitpicking's sake. Yes, there are scanlines when running lower frame rates with G-Sync enabled, but they are so hard to spot unless you literally have your face pressed to the screen. It's not an exaggeration, I could only see them when I put my eyes 3 - 4 inches away on a light grey background. It's really not worth worrying about, Acer have already said it's an inherent side effect of rapidly changing refresh rates, but again, if this is something that may bother you, put your money elsewhere and don't waste your time going through multiple returns to try and get a good one. The problem is there, but it's very minor and borderline invisible when viewing normal content at normal viewing distances. The OSD is a bit clunky, but once the monitor is set up you'll rarely need to dive in again. I calibrated mine using an i1 Display Pro and the accuracy was well under perceivable delta error margins. The speakers are actually pretty decent for a built-in solution. I'm currently using them because my speakers now don't fit on the desk, this screen is huge! The stand is sturdy and features height and tilt adjustments, it just takes up a lot of desk real estate. I'd recommend a VESA mount if you are looking for more space or adjustability. Overall, my experience has only been positive. I'm very pleased with the one I received and it goes to show that there are good ones out there, and I'm sure the majority of owners are very happy too. Once you try 21:9 gaming, the experience is so much more immersive that going back to 16:9 is like having blinkers on. 1 it can not reach 100hz...just 95 still not bad. I was lucky in the Toss, soon as I received it tested it with every test known to man to make sure I gat a good 1. No noise, no scan lines, pixels 100%. Colours aren't as good as my 32 BL3200PT BenQ but that is 10 bit. Very small amount of BLB in all 4 corners but you cannot see it at all when gaming. 100Hz with triple SLI Titan Blacks easy Valley 100+ FPS. 100Hz with SLI Titan Blacks Valley 70+ FPS. !00Hz with single Titan Black Valley 30 FPS no good. 2 TB or 2 780TI will run this monitor at 100Hz no Prob but 2 980TI would be better my Triple SLI Titan Black's is only just behind my mates SLI 980TI's so I will keep my Titan's for a year or so longer runs perfect. Take the plunge you wont regret it that's if you win the Toss. Been looking to going to curved superwide for ages, just could not make my mind up, been reading reviews about every 34 inch screen there is. This one was top of my list, but the problems people have been having made me very wary due to the cost. But i must say, i am over the moon with my purchase, i am glad i took the risk on this beast, ive had no issues what so ever getting it too 100hz. yes the menu is like a tab confusing, but once you have played around with it, its pretty easy to get around. Games are amazing at this rez, grab the chrome extensions for utube etc..
My first monitor had a problem with the overclock, 100hz did not work at all and experienced rapid black flickering at 95hz. I sent it back for a replacement which had no issue at all running at 100hz out of the box. Less backlight bleed in this unit also. Overclockers customer support were very helpful and friendly and i got a new unit pretty quick. 21:9 gaming at 100hz with gsync at this resolution is incredible. I recommend a 980ti or a Fury to make the most of this panels capabilities. I have been saving up for this thing all year, I was well aware of the issues surrounding this product and as an old system engineer well versed in acers build quality. But this thing ticked all the boxes for me and I finally bit the bullet and got one.....MY GOD this monitor is full of amazeballs. One caveat though, well two.. one you'll need some horsepower to make the most of the screen, I have 2 gigabyte G1 gaming 970's in sli and it works quite well....will I start saving up again for nvidias flagship graphics card next year HELL YES. Caveat two, the OSD control system is terrible, but the way I figure it is, once you have it setup how you want it and it's calibrated to your requirements, tbh you're not going to touch it again. As well as games I do lots of design work and again this thing rocks, this is my main display with a little 24inch LG in portrait next to it and in the past I had to spend a lot of time calibrating the LG, the Acer was pretty well much dead balls on straight out of the box. Oh and for any Elite players out there...planetary landings on this thing makes one stop having the ability to talk. Specs are excellent, and the FreeSync version looks sublime. What I don't understand is how peripherals manufacturer's haven't realised that just because we're gamers doesn't mean we want awful garish logos and colour schemes. If you can afford to drop a grand on a monitor, you don't want red LED lighting, and tramp stamps over your equipment. Did noone learn from the Corsair 'sails' keyboard debacle. So otherwise perfect monitor, ruined by a tramp stamp logo, which is why I cannot justify the £1000 price tag. For a grand, it's got to be perfect, and it's got to look classy. Got this to replace a 32" BenQ which I have now passed on to my son. Bought from OC on Black Friday and I honestly can't fault the performance and image quality. No dead pixels, no banding or any of the other issues I was worried about from reading the forums. It's running at 100hz and is butter smooth running my games including Arma 3 and Prepar3D at 3440 x 1440 on a Titan X. It's biggest fault is the menu system which is very difficult to understand hence it dropped a point. Almost no back light bleed. No dead pixels. Perfect Monitor to be honest. Colors out the box are pretty good. Although as mentioned, menu buttons are awful but I have only used them once so far to switch to 100Hz. Spent all morning watching videos in 21:9 and it has blown my mind how much different they look in ultra-wide. 100Hz & G-sync ON - DP cable on a Nvdia TITAN X card . Gaming & resolution just perfect on a 3440x1440 - I won't be going back to 1980x1080 res . For me it is worth it ,it's been a long wait for something like this to be released . I have 2 monitor ( 4K ) connected 1st is 60Hz , 2nd is 100Hz G-sync . I've had this monitor for a few months now and it it a great piece of kit. I have marked it down due to a number of small issues. 1. The screen flickers if i have it cranked up to the full 100hz 95hz works fine. 2. occasionally when in post the left hand side of the back-light is off but this corrects itself as soon as the pc starts to boot. 2. a very minor scan-line issue in Gsync mode in the top left corner of the screen this is worse in the pendulum demo from Nvidia. Its hard to see when playing games. I'm hoping Acer can come up with a fix for these 3 issues so I can get mine fixed. Apart from that its a fab monitor. Absolutely stunning. There have been a few problems with this monitor and so far I have noticed very few with mine from Overclockers. One thing to mention about the monitor I received, one of the LEDS on the bottom of the monitor is slightly bulged and there are some problems running at 100hz. Another reason for being 9/10 is because the on screen menu and buttons are disgusting to use. These aside, it is the most perfect monitor money can buy.